The CACS & Faculty: Partners in Student Success! 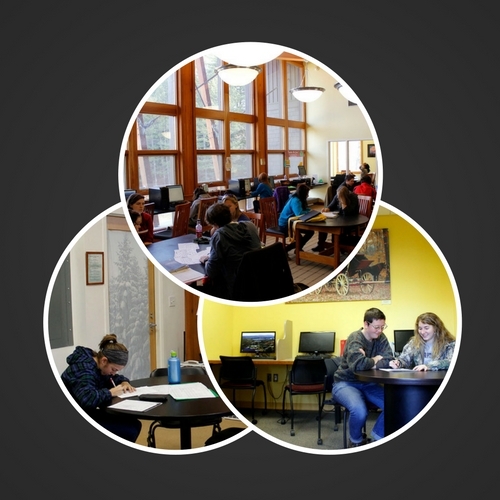 The Center for Academic and Career Success (CACS) is committed to supporting student success and helping students achieve their academic goals. Professors, instructors, and advisors are some of the best resources students have, and the CACS wants to ensure that we are always working to foster a strong collaboration with each of our Academic Departments. We’ve developed this page to serve as a resource for faculty interested in connecting students with our different types of academic support and student leadership opportunities. Our staff members are committed to partnering with faculty to ensure that we are offering the right type of support for the unique courses taught at Paul Smith’s College. We rely on your experience and expertise to help us identify and hire qualified students to lead our peer tutoring program. Our Success Coaches depend on your feedback and communication to develop plans that will guide students to achieving academic success and reaching graduation. Information on the services and programs we offer students, and ideas on how and when to refer students to the CACS. Information on the hiring requirements for Peer Tutors, SI Leaders, Writing Coaches and Peer Leaders, and the process for recommending tutors and setting-up support for your courses. Information on the roles and responsibilities of our student leaders what you should expect when a student of yours receives support from the CACS. Links to tools and worksheets to help your students develop their own academic success strategies. *Coming Soon! Presentations and Video Clips that can be utilized in your class, on academic success topics, resources and services. If you are interested in consulting with a staff member of the Center for Academic and Career Success regarding a student situation or any of our services, please contact us via phone or email. Please email acs_frontdesk@paulsmiths.edu or call the Center for Academic and Career Success front desk 518-327-6046.